"Why" you ask? It's for a very special girl who is turning 6 years old this Wednesday. So, if I slay the beast by Wednesday, I'll show you pics of the pettiskirt. Side note: Tomorrow, I will show you the peg dolls that will be available for purchase in the shop this week. I wondered about that when I saw your first blog. I made a prom dress once that was similar but not so full--I ended up throwing it away and feeling sick. I'll watch for the finished product, hope there will be details. I have three little grand-gals that would just love a skirt like that! The beast is no match for YOU! You have all the superpowers of crafting on your side, not to mention your faithful sidekicks...Peg doll-Oooh-ramas! I'm sure your cutie will love the skirt. Please tell her happy birthday from the Perez family. Kaye - When I finish it, I will post a link to the free pattern I used and I'll tell you how to avoid the problems I encountered. You can do it! just a quick tip when I work with that stuff I pin it alot and I love love roll hemming it with a serger as apposed to on a regular machine. Good luck! Jamie, yes you can do it! 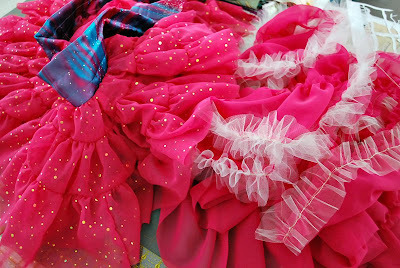 As much as i love satin and chiffon..i don't think i'll be able to work on them as they are sooo delicate. Im looking forward to your satin and chiffon project! Have a lovely merry happy day and lots of love to you! Oh I can't wait to see! Happy Birthday to your daughter! My daughters turn 16 on Tuesday. Time flies! Oh, hurray for the arrival of the Peg Dolls!! I've been checking in at your store in case I missed a post about them being there. Marissa - Thanks for the rolled hem tip. I thought about doing that, but I was unsure as to how the fabric would react. The directions call for a row of ruffles on the front tier, but I may just try the rolled hem stitch.